Songs of Eretz Poetry Review is pleased to name James Frederick William Rowe as its Poet of the Week for the week of February 15, 2015. One of his poems will appear in the Review every day this week starting on the 16th. Mr. Rowe is a Rhysling-nominated poet and author out of Brooklyn, New York and was a finalist in the 2015 Songs of Eretz Poetry Award Contest. 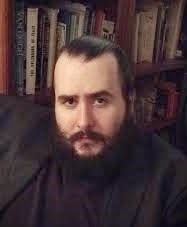 In the last few years, he has cut out a substantial niche in the speculative poetry front, having seen over thirty poems published internationally in such markets as: Big Pulp, Songs of Eretz, Tale of the Talisman, Heroic Fantasy Quarterly (where he is an editor), Andromeda Spaceways Inflight Magazine, and now Bete Noire. When he is not writing verses and crafting yarns, he is employed as an adjunct professor of philosophy in the City University of New York, is pursuing a Ph.D. in the same subject, and works a variety of freelance positions. The poet's website can be found at http://jamesfwrowe.wordpress.com.